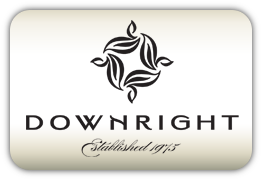 European tradition, American made; in 1975, Downright began with a mission of integrity and workmanship in the “Old Country” tradition of quality. Since, the company has steadily grown but continues to be a family owned and ran business. Every day, Downright proudly manufactures a full line of down bedding by hardworking, dedicated employees who are driven by a fierce determination and commitment to quality and comfort. Only the finest quality white goose down, with the largest and most resilient clusters, is used. This yields the superior grade that meets exacting standards. Each bale is carefully washed and sterilized, so that your bedding is 100% pure, luscious and hypoallergenic. The down is surrounded by carefully woven down-proof cottons and silks. And all ingredients are not just luxurious, but sustainable too. Downright's "No Fowl Play" policy ensures that there is no "Foul Play" anywhere in the supply chain. Fabrics are Oeko-Tex certified, while goose down is sourced exclusively from farms which are certified and audited by an outside authority. At such farms, birds are cared for from birth. There is no force feeding and no live plucking. Beginning in 2017, Downright products containing goose down will also be sold with a QR hang tag. This technology will allow you to scan the hashtag using your smartphone, and be directed to a third party website where can learn about the origin and certification of the specific item you are considering to buy.